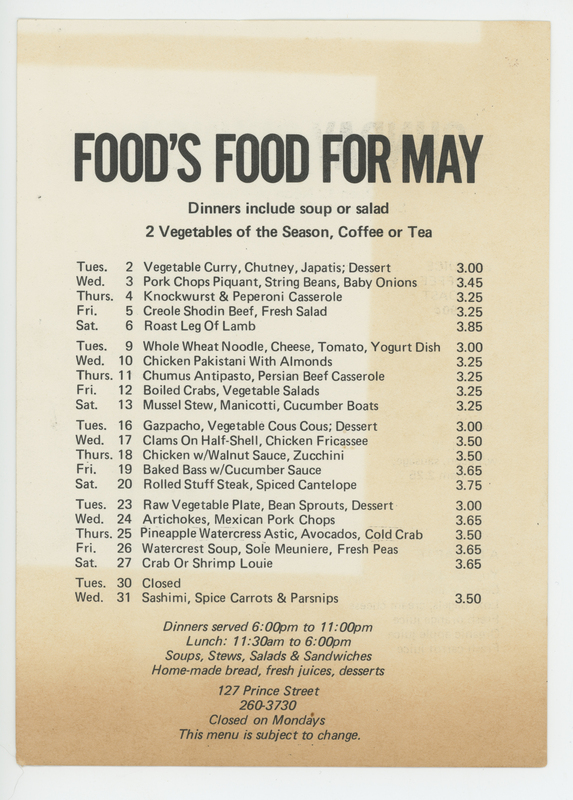 Food's Food for May | SoHo Memory Project. The restaurant Food was opened in late 1971 at 127 Prince Street at the corner of Wooster by three artists, Gordon Matta-Clark, Tina Girouard, and Carol Goodden. It employed struggling SoHo artists and served inexpensive but hearty food to the local community, at least at first, until it was written up somewhere and became a destination spot for uptowners as well as out-of-towners. It was, for a long time, one of the only places to eat in SoHo other than Fanelli’s and a few greasy spoons. It was also way ahead of its time in that it served fresh, seasonal foods cooked using local ingredients in an open kitchen. This may be de rigeur these days, but back then it was virtually unheard of.